It’s official, Dallas TX here I come! I'm delighted to announce that Suzanne Morgan and I confirmed last night Saturday 26th of April will be the date for my first ever teaching experience in Dallas, Texas! Because of a prior engagement we're keeping this to a one day natural printing workshop, participants will be asked to bring their own materials to print onto, felt, silk, wool and paper. All the details (including the price!) will be posted shortly, Suzanne is just working the logistics out now but if you're interested in attending please email her ASAP and she'll be able to answer most of your questions. I may also be teaching a workshop in Houston, please email me if you'd like to be kept in the loop for that, more details here and on FB as I get them! To whet your appetite here's a picture of a wall hanging I felted and printed at the beginning of this week, I love it and have decided to keep it to hang at Clasheen!!! The base is 19.5 micron merino with a generous helping of soy fibre and Firestar, the leaves were eucalyptus and the pot had a big mushy handful of pomegranate skins which had already been used for a couple of print sessions. I deliberately folded it so that I had three uneven panels of leaves, now I just need another 10 hours a day as I really want to make a another piece! 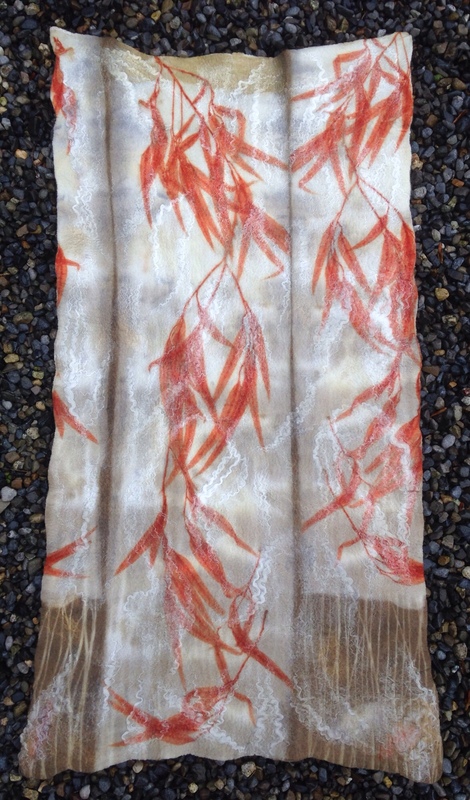 This entry was posted in America 2014, Felt, natural printing, workshops and tagged Clasheen, Dallas, Felt, felting in Dallas, natural printing, wall hanging by Nicola. Bookmark the permalink. It’s beautiful and the colours are ‘peaceful’ – no wonder you’re so pleased with it! Lovely! What did you use for a mordant? it looks very Asian inspired. Absolutely gorgeous wall hanging Nicola!